Here’s an exercise for becoming fluent with arpeggios. Use Practice Page #1 which will give you a way to practise in all keys. Then choose an arpeggio type, eg., Minor 7ths. Then apply a fretboard limit, say, ‘one octave’, and play over and over. Use 1 string. Start at the lowest available note for the arpeggio. Play all 4 notes in order. 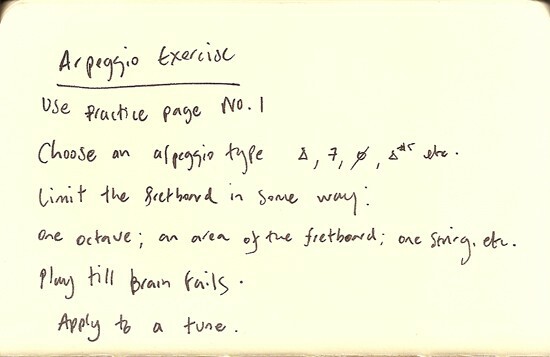 Do the same for the next arpeggio, always starting at the lowest available note. If there is an open string in the arpeggio play it, then play the other 3 notes in any order. Again, this is making you see the whole arp in one go and fracturing it rather than thinking from the root up. You’ll have to make a decision about what to do when there are 2, 3, 4, or no open strings available. Limit arpeggio to Major Triad. Play root on the D string, chromatic approach to 3rd, then 3rd on the G string, 5th on the B.
Here’s you’re just working on knowing the starting note on the D string, then everything else is the same pattern. Try using a metronome or practising with someone else to get a bit of pressure to nail it. Rather it’s about revealing your ability to USE this stuff in the moment. You want to expose that, put it under the microscope and work to move it to the next level. Personally, I try to balance my practice at about 20% of this kind of thing and 80% learning actual music. Check out this article for more on that.